It's A Clockwork Orange, a Stanley Kubrick film starring Malcolm McDowell and released in 1971. I don't think I have to explain how I created it but the stamp is an old freebie from Craft Stamper. Oh just to say that to get the blank clock face I used the image on the acetate panel it came with, cut out the centre and placed it in the centre of the stamp before I inked it. I made one more card using a freebie from a Creativity magazine and the crown is one of the stamps that came with the Anna Griffin self inking stamper. Can you guess the film this time? It's The Queen starring Helen Mirren, released in 2006. Two great cards. I love the one picting Clockwork Orange. I love it when there is another card colour used as white or off white. Love both cards, especially your take on the Clockwork Orange. Two beautiful cards Valerie! I love the orange one! 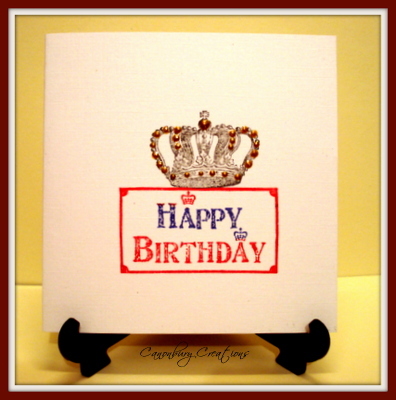 fab set of cards, val! 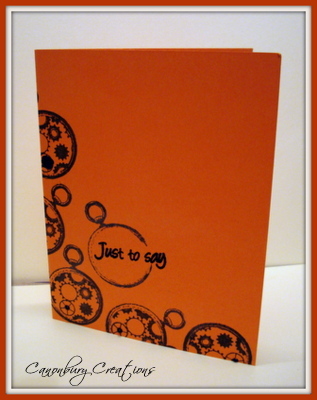 love your "clockwork" orange" card! love it!! what a great film to choose! Love your lateral thinking for your first card, heard of the film but I take it it's a thriller from Vicky's comment! !